A trio of undercover Brick police officers noticed a suspicious man walking through the parking lot of the township’s Walmart store Thursday and stopped the theft of items from a vehicle parked there. At about 5:20 p.m. Thursday night, Sgt. Erik Olsen, Ptl. Ryan Talty, and Ptl. Dominic Puccio – all members of the department’s Selective Enforcement Team – were working undercover when Puccio spotted a man described as white with a pony tail pushing a shopping cart full of white plastic bags filled with unknown items. The man was looking to his left and right and it appeared he was nervous, said Sgt. Neal Pedersen. 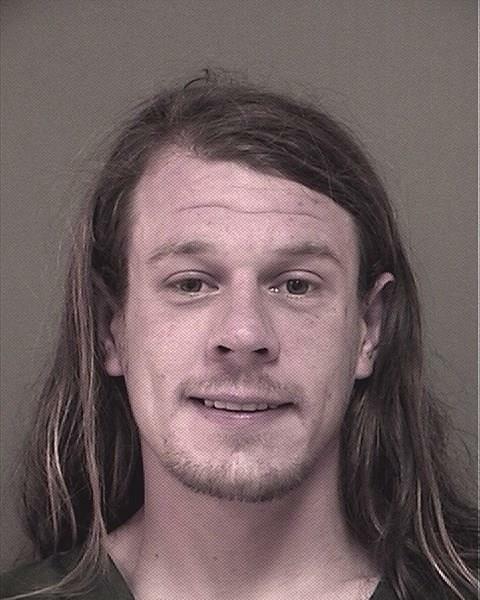 Puccio saw the man, later identified as James Bellas, 29, of Freehold, approach a black Toyota Corolla on the passenger side, open the passenger door and remove a black bag, Pedersen said. Bellas then placed the black bag in the shopping cart and began to run through the parking lot toward the Route 88 side of Walmart, according to police. Bellas placed the items into a silver, Nissan four door vehicle where he sat in the driver’s seat and began to look through the bags. At that point, Pedersen said, Puccio approached Bellas’s vehicle and identified himself as a Brick police officer. Talty arrived on scene to assist and they inquired about him entering the black Toyota. The officers were able to recover the item removed from the Toyota and locate the owner of the property who confirmed it was stolen from their unlocked vehicle, said Pedersen. Officers say they also located several items that were stolen from Walmart, valued at $34.40. Bellas also had a small amount of marijuana and several unlawful fireworks in the vehicle, police said. Bellas was placed under arrest without incident and transported to police headquarters where he was processed. He was charged with burglary, shoplifting, drug possession, possession of drug paraphernalia, possession of fireworks and a traffic summons for having drugs in a motor vehicle. He was taken the Ocean County Jail.